As a child, she was sent to an English convent for her education, and she was a very dedicated student. In fact, the other girls called her “Sainte Aurore” (her real name is Amantine-Lucile-Aurore Dudevant). When her grandmother found out that her granddaughter wanted to devote her life to religion, she immediately removed her from the convent and brought her home. George Sand’s father was related to a line of kings and to the Maréchal de Saxe. Her mother was the daughter of a professional bird fancier. She wrote for Le Figaro under the pseudonym Jules Sand. She often dressed as a man, learned to shoot and smoked cigars. The author was unhappily married to Casimir Dudevant and had lovers, including Prosper Mérimée (writer), Alfred de Musset (poet) and Frédéric Chopin (composer). She wrote every night from midnight until dawn and set a daily quota of 20 pages. She ended up writing more than 90 novels, 35 plays and an autobiography. 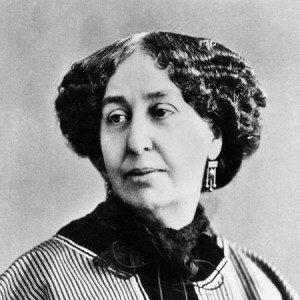 George Sand called for a reform of the Civil Code and was for the equality of men and women.